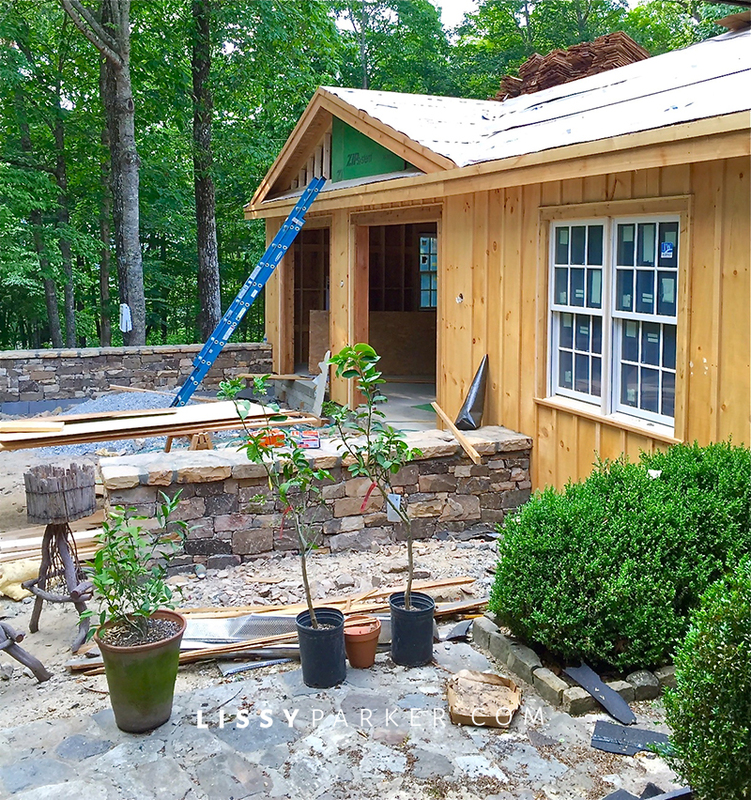 Things are moving along fast on my new addition in Cashiers, North Carolina. The framers, electricians, roofers and painters are working hard so that we can move in soon. The new garage is waiting for doors and the new entry garden with the stone wall is waiting for gravel and soil. I have beautiful conical boxwood ready to install any day now, as well. Building in the mountains is usually a long-drawn-out affair, but thanks to my skilled architect, Keven Hawkins, we’re moving along quickly. Have a look at the progress we’ve made—and we only started in mid April! Yes … we can—just two months and we’ve come so far. Go team! Here is an overview of the garden designed by Keven. Large pots will sit on the wall near the gate and drive. Pictured here is the new double garage and roof design. This is the new office and entertaining room. The drawing comes to life. This is the view from into the entertaining room. The stone chimney and bark walls are going in—Mr. P added a TV over the fireplace. The whole house is getting a new cedar shake roof. And finally, the center section will have a Chinese Chippendale rail! All photos by Lissy Parker for lissparker.com. You are welcome to ‘borrow’ my photos—just please credit the source. I love seeing the progress! Keep the pictures coming! I is happening really fast this time. I will update regularly!